People across the globe are seeking to be more intentional be it their health, what’s in their shopping cart or what they do with the space they have been given. With so many recent food recalls and kids not knowing where their food comes from, I not only encourage people to be wise in their purchases but also to grow their own groceries when they can. 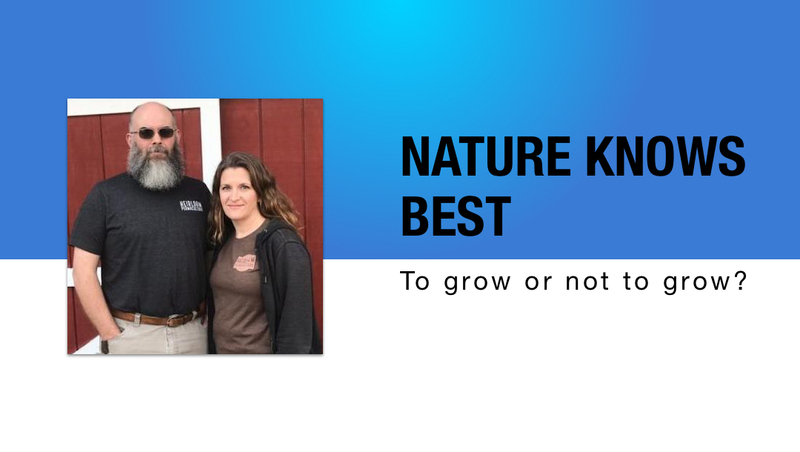 I recently sat down with locals John and Angela Wilson of Heirloom Permaculture, both of whom are certified Permaculture designers, to see what suggestions they may have for us. Permaculture, as defined by Wikipedia, “is a set of design principles centered around whole systems thinking simulating or directly utilizing the patterns and resilient features observed in natural ecosystems.” The Wilson’s say this can translate to pots on an apartment balcony all the way to a thousand-plus acre farm. Permaculture is a way of observing your space and working with it…naturally; to see where rainfall accumulates, where the sun shines and to base problem solving and designs off that. The goal is to work with nature, not against. For instance, if you have a garden and chickens then it would be wise to have them in close proximity. The chicken waste can fertilize the garden. The garden attracts bugs for the chickens to eat. Chickens can also prepare garden beds for planting by eating weeds. Chickens also eat scraps from the garden. Their relationship makes a wonderful cycle by utilizing all inputs and outputs. But…how does one get started? Angela Wilson said, “Just grow some food. Get started somewhere but don’t get overwhelmed.” Look in your grocery cart and see what you buy the most of. Does your family love tomatoes? Those can be grown easily in pots for beginner gardeners. Herbs such as thyme, basil and rosemary are fairly simple to grow. Mix that with your fresh tomatoes and you will have some amazing homegrown Italian dishes. According to the Wilsons a garden should produce, profit (not always financially) and bring pleasure. I do understand that the idea of gardening can be overwhelming (I am blessed to be married to a Horticulturist) but currently there are so many resources, classes and people willing to teach what they know that in my opinion, it has never been easier to learn how to grow. I was excited to learn that having a Permaculture mindset is more than just gardening. John encourages people to develop and strengthen their community. It is important to “share skills and strengths and know all your neighbors.” He highly encourages us to shop locally because “the impact is bigger when you make exchanges in your community.” Farmer’s markets, CSA’s, local farmers and family owned businesses are all encouraged. Budgeting is important. This can involve time, money, food supply and more. The intent is to make positive changes, use your resources and to become producers and not consumers as much as possible; always assessing the situation for changes to make the current situation better. I mentioned chickens earlier. Do you live in the city with a backyard? It is legal to have a few hens, check your city ordinance and any homeowner association’s guidelines. Please note: NO roosters are allowed in city limits! This is a pet peeve of mine (no pun intended.) A few hens can lay enough fresh eggs for a family. It’s such a fun, learning experience for children and adults alike. In closing, I would love to inspire you to try something new be it making baby food, raising a bottle calf or having your first ever garden! There comes a wonderful sense of accomplishment with this but it also saves money, reduces waste, can be a healthier option and is fun!